(0 Customer Reviews) | Write Review 6 issues per year The World of Seadrill exists to enrich the working life of the people of Seadrill, with a great magazine which informs, updates and celebrates success. The World of Seadrill is an internal magazine and meant only for Seadrill employees, it is forbidden for non-Seadrill employees to download the magazine. The World of Seadrill exists to enrich the working life of the people of Seadrill, with a great magazine which informs, updates and celebrates success. You'll receive 6 issues during a 1 year The World of Seadrill magazine subscription. 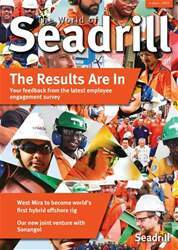 You'll receive 6 issues during a 1 year The World of Seadrill magazine print subscription.